It has been a busy month in the refugee and asylum seeker advocacy space, with increasing pressure being put on government to provide a substantive solution for those caught in limbo on Nauru. CAPSA members and supporters have been involved in a variety of ways with this broader sector work — from directly meeting with politicians, sending emails, passing on information, and engaging in acts of protest, solidarity and prayer. We are seeing the Australian public’s attitude shift a little in this space, to a more humane and compassionate approach to people seeking asylum. Thank you for your tireless work. Asking that individuals residing on Nauru and Manus are resettled with urgency to places where they are treated with dignity and have the possibility for a secure future where they can flourish. There is incredible work being done, and much more to be done: keep up your efforts! If CAPSA can assist to coordinate actions, to speak, or help out in any way just get in touch. There are many events, vigils, and actions taking place all through November. We hope that you will join in with them, and continue to bring a Catholic voice, values and approach to this space (and send us photos/tell us what you have been up to!). CAPSA is only made possible by the generous contributions, support, work and service of the Catholic community. Make a tax deductible donation today! 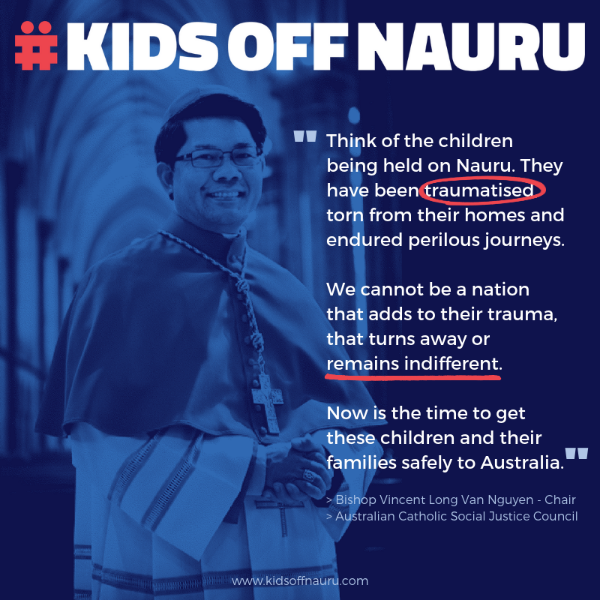 Bishop Long is an ambassador for the #KidsOffNauru campaign. You can sign up here to get involved. If your school, parish, or organisation are involved in supporting the #KidsOffNauru please send us any photos or a sentence about your contribution, and we will collate and share these with key decision makers and others in the community. Love Makes A Way is organising prayer vigils across Australia in partnership with Common Grace, Australian Churches Refugee Taskforce, World Vision, and Micah Australia, as part of the #KidsOffNauru campaign. These will happen across the country on Friday 2nd November. Some key information on people seeking asylum in Australia/offshore. There are a number of split family groups due to medical transfers from Nauru to Australia/Taiwan, comprising 61 family members. 30 of those family members are located on Nauru and 31 are located in Australia. 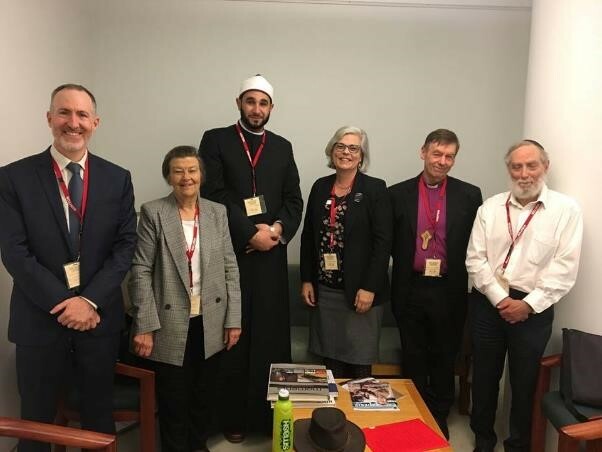 An interfaith delegation, which included Libby Rogerson who chairs Catholic Religious Australia’s justice committee and sits on the Jesuit Social Services board, met with Minister David Coleman and Shayne Neumann last week to give their thoughts on a solution regarding the lamentable situation occurring on Manus Island and Nauru. This delegation added to and amplified the concern being voiced by faith-communities across Australia. If you would like to meet with your MP, or organise a similar delegation, check out our “meet your local MP” section of our toolkit here. Feel free to get in contact with CAPSA and we will support you with up to date numbers, stats, and key talking points. An opportunity to explore an international perspective on issues facing people seeking asylum. Fr Michael Kelly sj, an Australian journalist and publisher, lives in Bangkok, Thailand, where his life intersects with many people seeking asylum. Many of these live messy, dangerous lives, and those that work with them need to keep in mind that ‘the only unforgivable sin is despair’. Click here for a recent article on this topic by Fr Michael in Eureka Street. Jesuit Refugee Service ‘JRS’ Australia are co-hosting a public forum alongside Asia Pacific Refugee Rights Network (APRRN) and Western Sydney University‘s Humanitarian Development and Research Initiative on ‘Australia and the Global Compact on Migration: Opportunities for a New Agenda’. Join an incredible line up of panelists to discuss the importance of this Global Compact on Migration (GCM), and learn more about how the Australian government and civil society actors can support, implement, monitor and review the GCM.